Banshee is an open-source media player, called Sonance until 2005.Built upon Mono and Gtk#, it uses the GStreamer multimedia platform for encoding and decoding various media formats, including Ogg Vorbis, MP3 and FLAC. Banshee can play and import audio CDs and supports many portable media players, including Apple's iPod, Android devices and Creative's ZEN players.Other features include Last.fm integration, album artwork fetching, smart playlists and podcast support. Banshee is released under the terms of the MIT License. Stable versions are available for many Linux distributions, as well as a beta preview for Mac OS X and an alpha preview for Windows. Banshee 2.2 is the culmination of six months' work by 35 developers, 38 translators and dozens of bug reporters and testers. It is a stable release, the successor to Banshee 2.0. 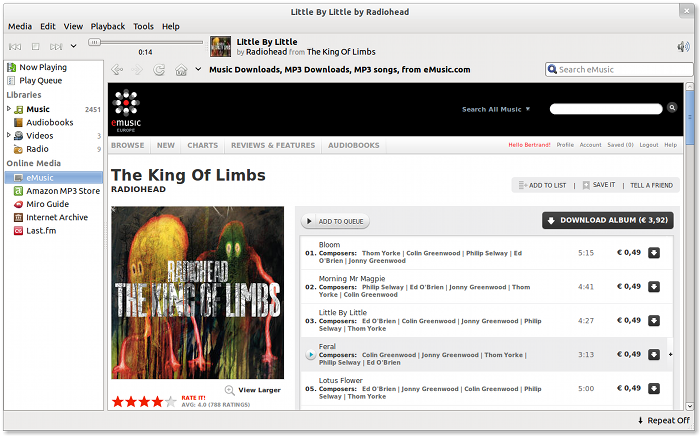 Browse, search, preview, buy, and download music straight into your Banshee library from the eMusic online store. Transfer music between your library and your Nook device, it just works ! At first start, XSPF playlists in $datadir/banshee/stations/ are imported automatically. We don't provide default radio stations ourselves but this allows distros or other third parties to do so. Various enhancements to our experimental GStreamer# backend, bringing it close to feature parity with our current C backend. It is still not built by default and not recommended for daily use, but testing is welcome. I’m running Ubuntu 10.10 can I update to Banshee 2.2? I have tried with no luck?